5793 labyrinths found. Showing 2821-2840. Sorted by country, state, city, then zip/postal code. Permanent, outdoor, handicap-accessible labyrinth open to the public. Located south of the cottage on the church campus. During daylight hours - check with the church office administrator for scheduling group events. The Virginia B. Fairbanks Art & Nature Park is open from Dawn to Dusk, 7 days per week. Google maps aerial view. Labyrinth in bottom left. 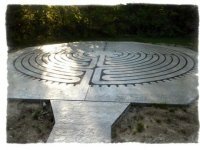 The labyrinth is located inside the park and can be found by following the main gravel trail into the park. You can then take a left when close to lake passing by the swing set. Then when near the "Funky Bones" Exhibit walk South into the field and travel to the back of the field. You will see the labyrinth located in the middle of the field. It is a path created by grass reeds as the guiding barriers. On Indianapolis eastside - approximately 1 mile east of German Church Road and 1 block south of E Washington Street. 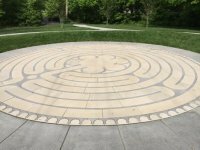 The World Peace labyrinth was originally created for the Salt Lake Olympics in 2002 and was placed in the olympic village chapel for use by all athletes. The design incorporates symbols of peace from several cultures. It is now available for peace events - contact us to arrange usage. 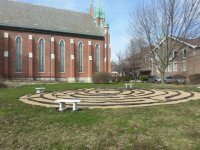 Indoor labyrinth open every Friday 5pm-7pm; outdoor labyrinth open daily, during daylight hours. Enter property from Meridian. Make first right turn and follow road to rear parking lot. Labyrinth is on the right hand side as you enter the farthest parking lot. Located along the Riverwalk in Downtown Jasper, Indiana. While the physical location of the church is 950 East Washington Street in Lebanon, some GPS systems locate that address at the nearby cemetery. 950 East County Road 75 North is sometimes more accurate for GPS purposes. 43° 31' 31.125° Lat. ; 72° 26' 8.5106° Long. Take Mill Road east off of St. Rt. 25, just past Memorial Hospital. Mill Road is not marked and is directly between two buildings- it looks like an alley. Park and walk back into woods, following the trail. 4 miles west of I-65, 1/4 mile south of Rte. 2, just east of Lowell - labyrinth is SE of the parking lot. When snow is on the ground, it is difficult to find the labyrinth paths. 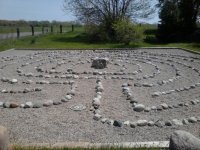 Outdoor Labyrinth located along the Merom Conference Center's Meditation trail. Merom is located halfway between Terre Haute and Vincennes at the intersection of State Routes 63 and 58. Guests on the site are limited during the summer camping season (mid June - mid August). 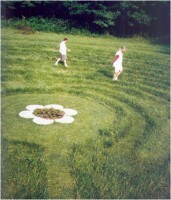 The Labyrinth is located behind the big white barn which is next to the Tryon Farm Guest House B&B. To park, pull off Tryon Farm Lane onto the grass near the Labyrinth. from points north, in Morgantown at the stop sign, turn south on SR 135. Follow SR 135 to Beanblossom. In Beanblossom, just past the grocery store, turn right on State Road 45. Follow SR 45 through Helmsburg. About two miles past Helmsburg, SR 45 makes a sharp left curve. At that curve, look for the Waycross sign and turn right onto Branstetter Road. Follow Branstetter Road about one-fourth mile to a stop sign at Bear Creek Road. Go straight at the stop sign onto Bear Creek Road. go about three miles to conference center. Get directions at desk. labyrinth is behind conference center, check in at Conf. Center office upon arrival. In a small park just over the way from the New Harmony visitors centre.